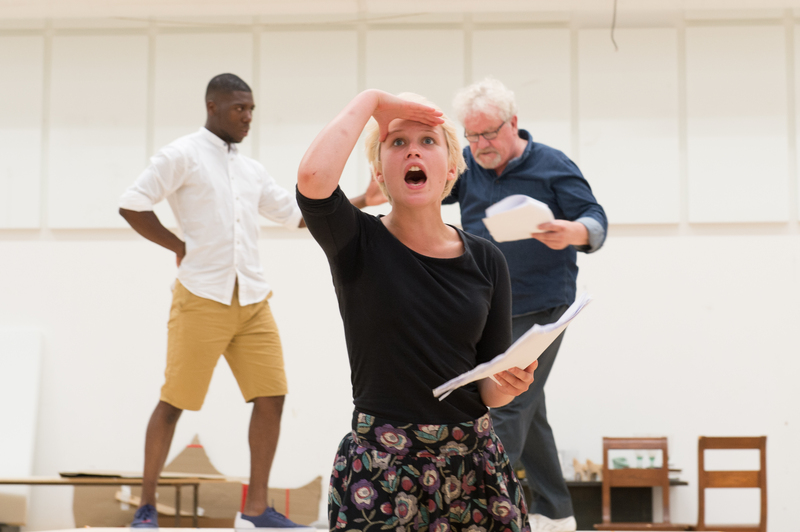 Mark Ravenhill is now in his second year as Writer in Residence at the RSC. 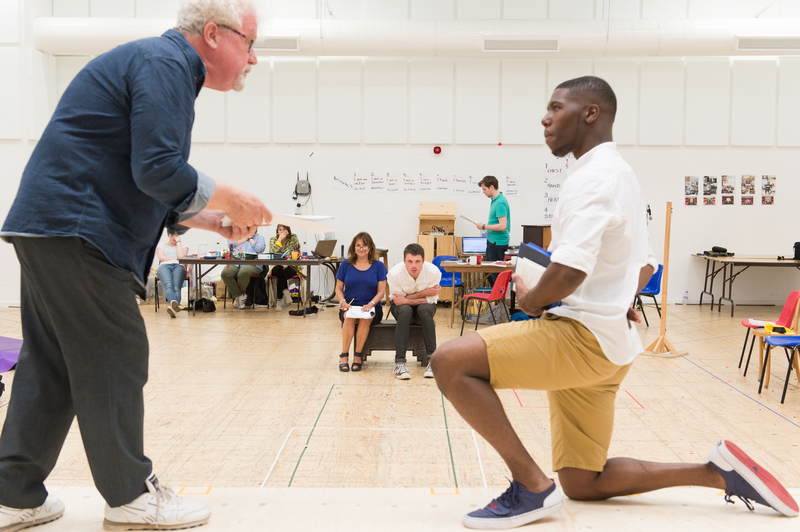 His latest play, Candide, ‘inspired by Voltaire’, is currently in rehearsal and opens at the Swan Theatre in Stratford on 29 August, where it will run until 26 October. The play is directed by Lyndsey Turner, and the advance publicity warns that the performances will include ‘strong language, violence and reckless optimism’. 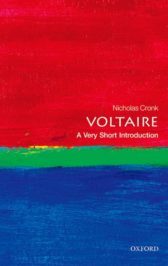 Nicholas Cronk, director of the Voltaire Foundation, went to watch an early rehearsal and talk to Mark Ravenhill. Nicholas Cronk: The RSC invited you to write a new play on any subject: what made you choose Candide? Mark Ravenhill: Candide is one of those books I read when I was young and that I come back to regularly. It’s a book that makes me laugh and think – it would be very hard to like someone who didn’t enjoy Candide! Also, everyone thinks they know Candide – you hear people described as ‘Panglossian’. So if Candide appears on a poster, it feels familiar. NC: Candide has often been rewritten as a narrative, for example George Bernard Shaw’s Adventures of the Black Girl in her Search for God (1932), but less often successfully reworked for the stage – with the notable exception of Bernstein’s Candide. 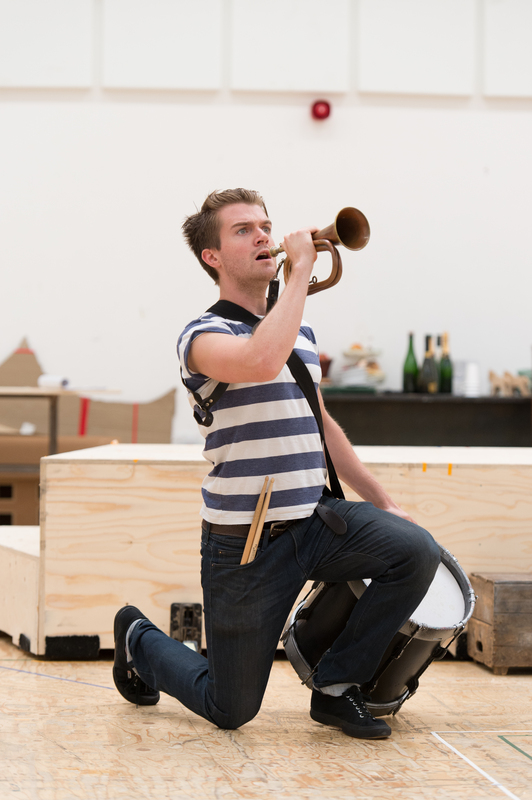 What are the challenges of rethinking this work for the stage? MR: There is a remarkable nimbleness of style, a balancing act of tone, in Voltaire, which is hard to bring off on stage. When you speak the words out loud, the effect is very different from when you read them. So one needs to do something new with a stage performance, not simply ‘tell the story’. When I was asked by the RSC to write a new play, I was already thinking about ideas of happiness and optimism in modern society. The American journalist Barbara Ehrenreich has written about this in her book Smile or Die: How Positive Thinking Fooled America and the World (2009) [in the USA the book is called Bright-sided: How the Relentless Promotion of Positive Thinking Has Undermined America]. She talks about the happiness industry, the rise of medication to make us happy and of self-help books, and the influence of all this on religion. In many ways religion has become another form of self-help. We all suffer from over-exposure to positive thinking. NC: I like the idea of Voltaire as agony aunt. 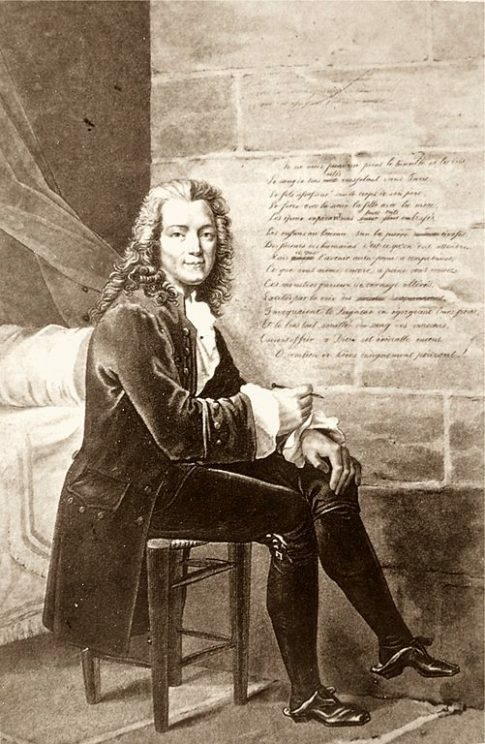 There is a novel by Dinah Lee Kung, A Visit from Voltaire (2004), in which the ghost of Voltaire turns up to sort out the problems of a modern-day American family living in Geneva…: this is Voltaire as the inventor of the self-help manual. NC: Voltaire’s novel makes fun of Pangloss and the Leibnizian idea that evil doesn’t really exist. And you feel we are living in a culture that can’t face up to the existence of evil? that makes Panglosses of us all? MR: We are now so far advanced in our denial of evil that we want to rationalise it away. Twenty years ago, when you bumped into someone and asked how they were, they would say, ‘Mustn’t grumble’ or ‘Getting by’: now they feel obliged to say ‘Just great!’. In both cases, the reply is just a social nicety, but the framework has changed, it’s as if it’s become a social duty to express happiness. Optimism and happiness are not the same thing, but they are becoming interchangeable, and it seemed to me that Voltaire’s Candide gave me a way into something important happening in modern-day culture. NC: Are there other ways in which the text has contemporary echoes for you? MR: Rereading Candide, I was struck by the link between optimism and the optimal, the idea that we have been placed in this optimal world rather than some other. Voltaire’s novel offers us parallel universes, the possibility of entering into alternative worlds existing side by side, and this is something quite modern. Nested narratives and parallel universes are popular at the moment in many different art forms. MR: Yes, even within single sentences, there are sudden changes of register. And when the travellers go to Venice, they see a play by Voltaire! 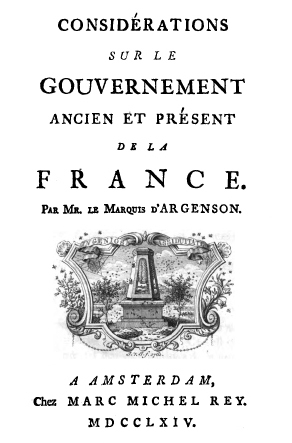 This is a novel which has narratives within narratives, such as when Cunégonde recounts her story. NC: And these nested narratives and parallel universes shape your new play? MR: I have not chosen to create a linear story, but a series of different narratives: in the end there are five plays that almost, but don’t quite, add up to one play… I start with the story of Candide, being performed as a play within a play, to bring the audience up to speed with the story. Each scene exists in a different universe and moves between different genres. The fourth scene invites us to join Candide in Eldorado and explores life as it could ideally be: this is proto sci-fi, rather like what happens in Gulliver’s Travels. And in the fifth and final scene, we move slightly into the future, as Pangloss finds success as the purveyor of optimism. NC: How easy is it to stage contemporary characters engaging in philosophical debate? MR: Theatre within theatre, when characters sees themselves on stage, always raises philosophical questions of choice and free will. And then there is the question of language. Although the play is not written in strict verse form, there is an underlying beat of rhyming couplets, with echoes of Pope and the tradition of eighteenth-century philosophical verse. NC: For members of the audience who would like a refresher course in Candide before the first night, you have produced a special new version of Voltaire’s novel? MR: Yes, I have adapted the whole book into tweets of 140 characters, and these are being sent out daily, at the rate of eight tweets per day [from 26 June to 29 August: @TweetCandide]. NC: It tells us something remarkable about Voltaire’s style that his novel lends itself so well to this exercise. You have invented a completely new way of translating Candide: I hope one day we can publish it on the website of the Voltaire Foundation! MR: Yes, translating Candide into tweets has really deepened my appreciation of his writing – it wouldn’t work so well with nineteenth-century authors. Every single sentence in Voltaire seems to advance the story, and yet stand alone as a sound-bite. 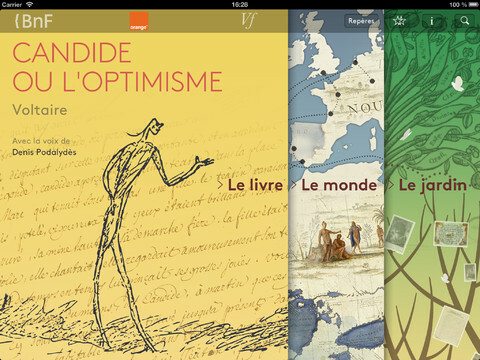 At the core of the app is René Pomeau’s critical edition of Candide published by the Voltaire Foundation (OCV, volume 48), but lots more has been added. A guiding idea behind the project was to make the text accessible to teenage readers (for example, by supplying a parallel set of annotations aimed specifically at that group), and to judge by the tweeted and blogged responses, it is succeeding. In what is certainly the best (and shortest) review ever given to a VF publication, one French fan has written that the app is “bien foutue”. But the app is interesting to readers at all stages. 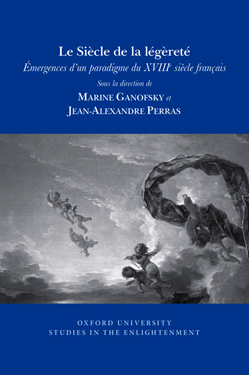 You can listen to Candide as well as read it, and the actor Denis Podalydès gives a beautifully clear and cool reading. 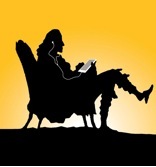 It’s great to discover the music of Voltaire’s prose: I find that hearing the text read aloud brings out nuances of humour and irony that I’ve missed in silent reading. Another special feature of the app are the images of the La Vallière manuscript, which dates from 1758, the year before Candide was published. This manuscript has been well known since the 1950s, when it was discovered by Ira Wade, and for this app, the Bibliothèque de l’Arsenal has made new high-resolution images. 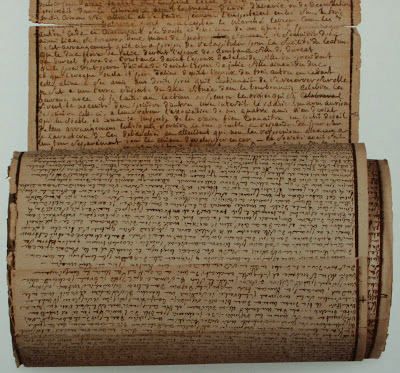 It is possible to study in a split screen images of the manuscript alongside the subsequent published version of the text, or to look at the manuscript on a full screen and even to enlarge any part of it. The quality of the images is amazing: as you enlarge them, you can almost feel the secretary Wagnière writing as Voltaire dictated, and you can experience in close-up the moments when Voltaire in his own hand intervenes or corrects his secretary’s draft. In Chapter 1, we remember how Pangloss is introduced, as a teacher of “la métaphysico-théologo-cosmolonigologie”. 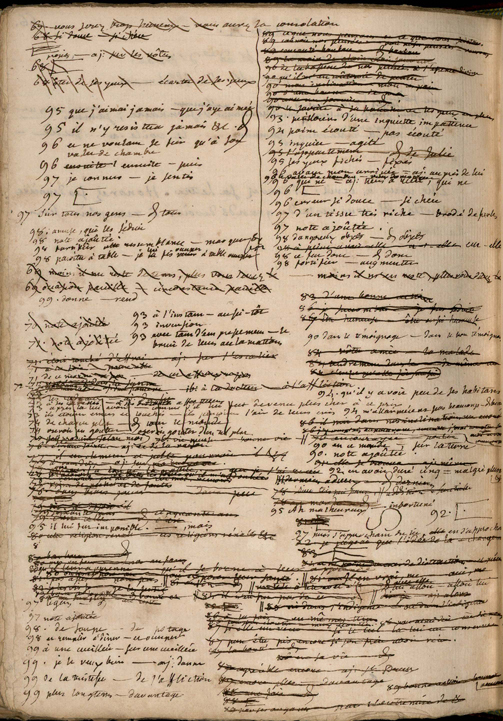 In the manuscript, we can see how Voltaire first tried “métaphisico-theolo-cosmolo-méologie”, then changed the last word to “mattologie” – here you can actually catch Voltaire in the process of inventing a new word. In Chapter 4, Candide recalls his love for Cunégonde: “il ne m’a jamais valu qu’un baiser et vingt coups de pied au cul”… When you look at the manuscript, you can see how the words “dans le cu” are added, in Voltaire’s own hand, as an afterthought, squeezed into the right-hand margin. Of course all this information is in the apparatus of the VF edition, but no description, however accurate, quite replaces the experience of looking at the original manucript. Digital images of this quality give us a vivid sense of spying on Voltaire while he is writing.